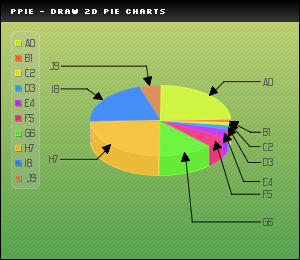 This function allows you to draw a 3D pie chart. All the drawing parameters are given trough a $Format array. To learn more about this please read the Format array guide. You can specify if the radius of the pie chart with Radius. You can specify the skew factor with SkewFactor (>0.5 <=1). You can specify the height of each sloces with SliceHeight. You can specify the angle in degree between two values with DataGapAngle. If your specify a gap, you can set the inner radius withDataGapRadius. You can enable a 2nd AA pass setting SecondPass to TRUE. You can write the data values setting WriteValues to PIE_VALUE_NATURAL to display the slice value or to PIE_VALUE_PERCENTAGE if you want to display the computed percentages.